This document explains the rcrack program. The rcrack program lookup existing rainbow tables for the plaintext of user supplied hash. Command line program is ideal for batch processing, and GUI program is easy to use. Rainbow tables used by rcrack program must already be sorted with rtsort program, and optionally converted to .rtc file format with rt2rtc program. Assume rainbow tables are in directory c:\rt. In the example above, hash_list_file is a text file with each hash in one line. In the example above, the rcrack/rcrack_cuda/rcrack_cl program will lookup rainbow tables in c:\rt1 and c:\rt2 directories sequentially. 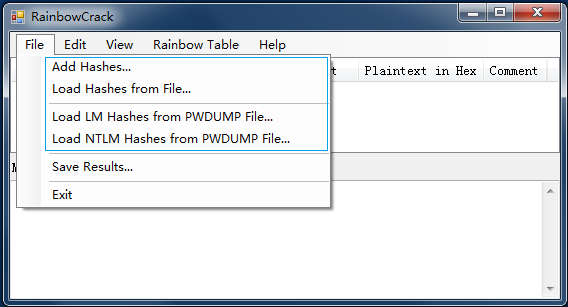 LM/NTLM hashes are usually saved in text file of pwdump format. Select "Search Rainbow Tables..." to search individual rainbow tables. Select "Search Rainbow Tables in Directory..." to search all rainbow tables in a directory. 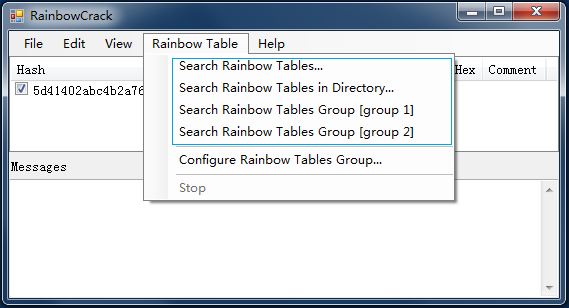 Select "Search Rainbow Tables Group [group name]" to search rainbow tables in multiple directories sequentially. All rainbow table groups are defined in configuration file group.txt. When rainbow tables are specified, hash cracking will start. 4 GB memory is minimal and 8 GB or more memory is recommended. Larger memory always help to improve performance when searching large rainbow tables. Because rainbow table must be loaded from hard disk to memory to look up and some rainbow table set can be as large as hundreds of GB, hard disk performance becomes a very important factor to achieve overall good hash cracking performance. We suggest put rainbow tables in RAID 0 volume with multiple hard disks. Windows operating system natively support software RAID 0 called "striped volume". The rcrack program always read data from hard disk sequentially. There is no random access. RainbowCrack software supports GPU acceleration with CUDA enabled GPUs from NVIDIA and OpenCL enabled GPUs from AMD. GPU acceleration with multiple GPUs is supported. To get optimal performance, all GPUs need be of same model.